The view from the room and the beach. The staff was very nice. The views from the breakfast room are incredible. So beautiful. 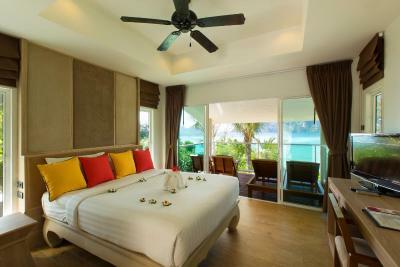 The beach area is also very very beautiful and the views from the high up rooms is also amazing. It’s a big resort so if you like walking around (mostly up very steep hills) and getting to quiet tiny beaches that are almost unvisited then it’s brilliant. The food in restaurant was also quite good actually. The staff was very friendly and helpful!! Especially helping my aunt get into the boat after her foot Injury !! They literally carried her ! It was so aweosme !! You guys ROCK !!! The cute little bungalows alll pretty much had a good view of the ocean even mine being a garden view ! The property was nice even though it’s all mostly uphill - be warned - when you come to Thailand PACK LIGHT !! Cutest little private beach right at the end of town ! Super close to the center with all the shops but just far enough for it to be very peaceful at night ! HIGHLY RECOMMEND- DEFINITELY COMING BACK !! The amazing view, amazing location, totally paradise!! Hot showers and tuk tuk rides from lobby to room! Loved the green curry chicken with eggplant! The laundry service next to hotel was good and cheap! Beautiful sunsets, safe clear water and powdery sand. 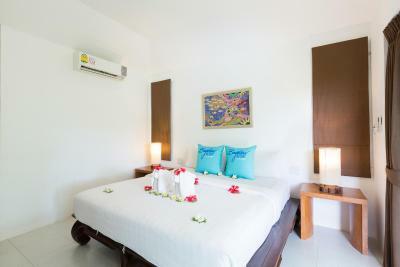 The beautiful location on the beach and walking distance to main bars and restaurants. The guys that work on the long boat and drive the trucks - kind and friendly, pick you up from the pier and carry your bags, drive your bags up the steep hills to the rooms. Activities could be arranged at the resort. Transfer from / to Tonsai Pier. Very friendly staff. 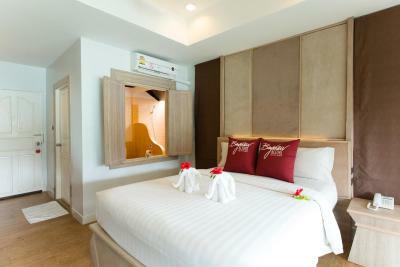 Nice spacious rooms, comfy bed, good location, really beautiful views and the shower and bathroom were perfect. 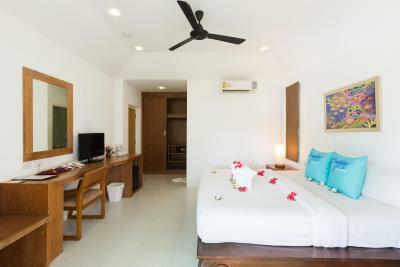 Phi Phi Bayview Resort This rating is a reflection of how the property compares to the industry standard when it comes to price, facilities and services available. It's based on a self-evaluation by the property. Use this rating to help choose your stay! 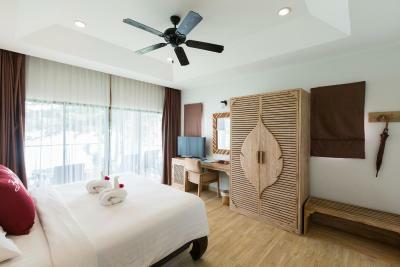 Sitting on the tranquil hillside of Laem Hin Beach, Phi Phi Bayview Resort overlooks Phi Phi Island and offers air-conditioned villas with private balconies. 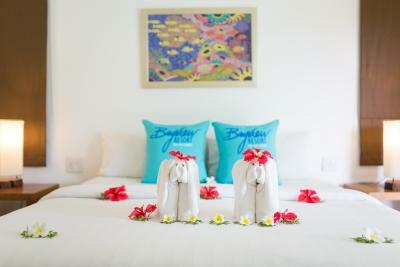 They feature a pool and traditional massage services. 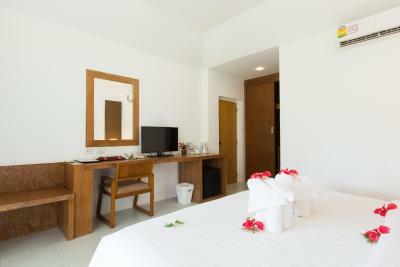 Steps from the beach, Phi Phi Bayview Resort is also just a 10-minute walk from town center, shops and restaurants. The resort offers a free boat ride from the pier to the village. 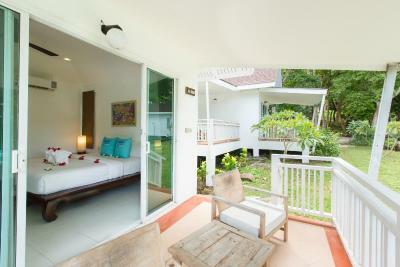 Surrounded by beautiful tropical landscapes, villas have large windows that allow much fresh air in. They are equipped with a satellite TV and a well-stocked mini-bar. Featuring wooden flooring, they also come with a private bathroom. 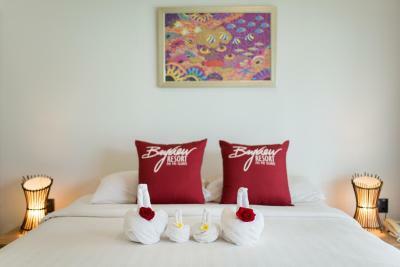 Guests can enjoy a swim in the outdoor pool with spa bath and swim-up bar or make use of the scuba diving classes. Other services include tour and transportation arrangements. 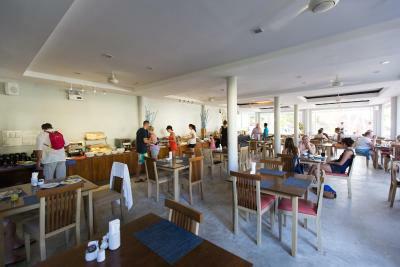 The resort's beachfront Kinnaree Restaurant provides a memorable outdoor dining experience, serving a hearty American breakfast followed by a la carte menus serving Thai and international dishes. It also offers a seafood buffet for dinner. There is also a beach bar on site. 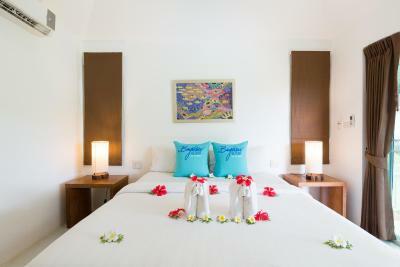 When would you like to stay at Phi Phi Bayview Resort? This spacious villa features a private balcony offering views of the grounds. 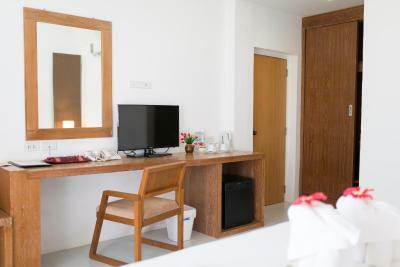 Includes satellite TV, fridge and minibar. 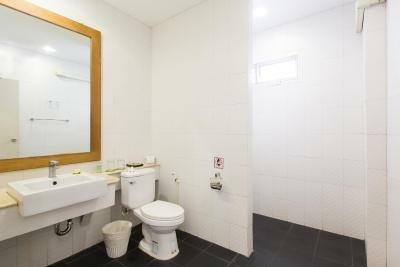 Hot shower is included in a private bathroom. 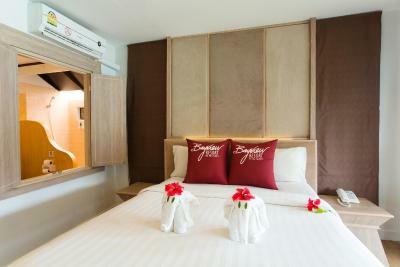 Please note that room can accommodate a maximum of 3 guests. 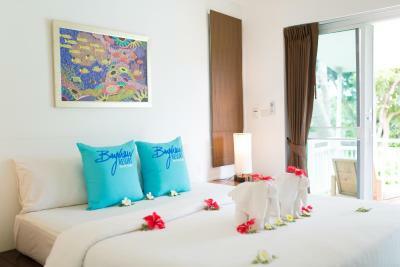 This larger villa features a private balcony, a satellite TV and minibar. A hot shower is included in a private bathroom. The largest villa features a balcony overlooking the garden. This villa comes with a balcony, a 32-inch flat-screen cable TV and a DVD player. It also has an electric teakettle and a safe. 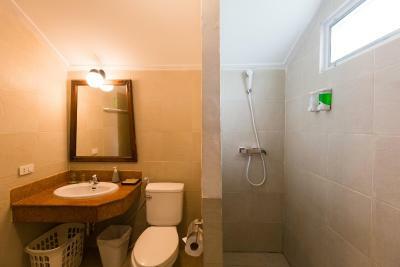 A private bathroom is fitted with a rain shower. 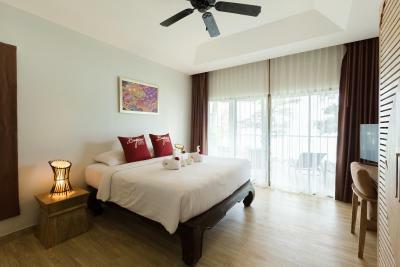 The Bayview Phi Phi Beach Resort consists of 154 split-level bungalows situated on the hillside of the Laem Hin Beach and surrounded by thick trees and lush tropical gardens making The Bayview Resort the best location for your dream holiday on our Phi Phi Don Resort in Krabi Province of Thailand. 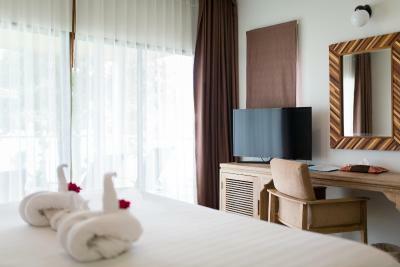 WiFi is available in the hotel rooms and costs THB 100 per hour. 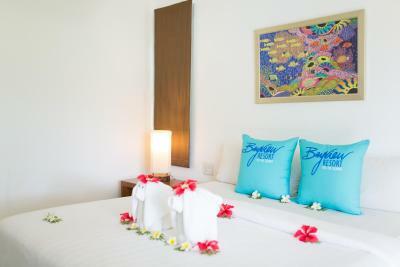 House Rules Phi Phi Bayview Resort takes special requests – add in the next step! 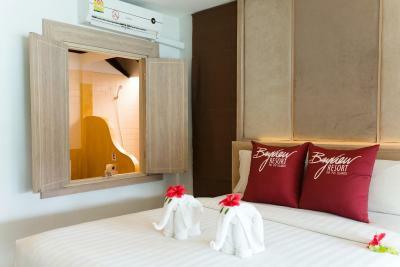 All children under 12 years are charged THB 850 per night for extra beds. 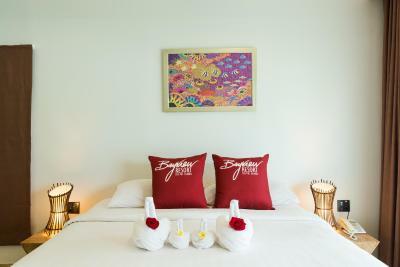 Any additional older children or adults are charged THB 850 per night for extra beds. 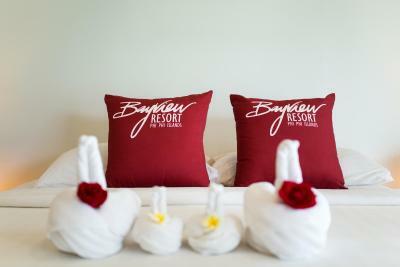 Phi Phi Bayview Resort accepts these cards and reserves the right to temporarily hold an amount prior to arrival. 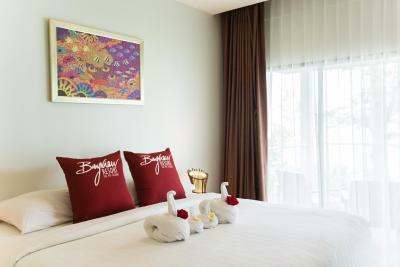 Please note that room rates on 31 December 2019 include a New Year Eve buffet dinner. Extra guests will be charged separately. Please note the the resorts swimming pool will be closed for maintenance starting 1 August 2017 until further notice. Guests may get a swimming pool voucher at the reception to access the Andaman Beach Resort's swimming pool, which is a 10-minute walk from the property. 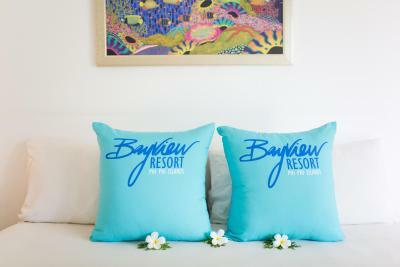 Please inform Phi Phi Bayview Resort of your expected arrival time in advance. You can use the Special Requests box when booking, or contact the property directly using the contact details in your confirmation. Hotel was far from center. A lot of stairs to get to the rooms. We booked double bed and got two single beds joined. The AC took an hour to cool the room. The water In the shower was not hot and salty. And there was smell of sewer when you take a shower. The bedsheets and towels were stained and with holes. Breakfast was very basic. Cheap, nice room. Beautiful beach. 15 minute walk to main phi phi don. Bed was comfy and good air con. The staff was very rude. We asked If we could change our check-out time and seems like is about charging extra money for tourists. The pool is absolutely a waste of time. Super dirty seems like no one care about it. Even the staff that was working at the bar at the pool was looking at his phone all the time when he could clean the area a little bit. Also, If you are going to book with them make sure you understand that every single room is LOCATED UPHILL and is very annoying going up and down to the room all the time. I do not recommend this place. Far from the main area. Location is a bit out the way and on a steep incline, also the pool area needs attention. The rooms were good with stunning views. Individual chalets that were clean and neat. The water in the shower and in the sink was salty and dirty (brown). The water in the shower has no presure and wasn't really warm. The pool is horrible, it's broken and the water quality is really bad. The toilet at the pool is awful. We left the pool after 2 minutes. The beach is not really for relax, many people are walking around and the noise of the boats is loud. There are no umbrellas on the beach. We hadn't towels in our room and then the service forgot about that. The walk to the rooms was OK, when you are in good condition. You can walk to the city, in 15-20 minutes. The view to the beach from our room. Breakfast was okay. The breakfast accommodation was actually very boring. Advice to the staff: please make a normal Playlist, instead of clicking thruw Youtube. Dental kit, shaving kit were not placed. Reaching the room was not easy. The water supply in the bathroom was not treated one, had too much salt content. The hand spray of the commode is fixed on the left, room service response was not quick. They’d easily returned money when we said that it is impossible to stay in such conditions. Case: In the evening, after the beach (because of hot, it was impossible to solve the problem in the day time), I asked to change the villa for the booked one (like on photos on Booking.com), the staff simply suggested to return prepaid money for the whole stay, including this day. It’s not the one such case, I guess, they were too indifferent and even a bit sneering. 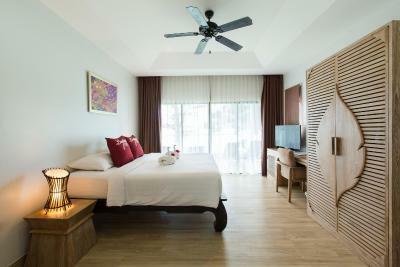 The property is very nice and the rooms are very cozy. The view on the bay is amazing and worth the additional price. There's free taxi boats to the pier for people going on trips or checking out. The breakfast is very nice and there's a large variety of food. We didn't use the pool (we didn't even see it) as the beach just below the hotel is very nice, and the Long Beach is just 10 minutes walk away. Our room was on 3rd hill and most of the times there was no vehicle to take us up. Also our friends had to carry their luggage 3 hills up. We liked the location and the view of the room. Beautiful place, just that it's quite a hike to get to your room. Other than that almost perfect. Coffee was not that great and they do not have the option for room breakfast but maybe that is too much for me to ask. Fruit juice was not made with fresh fruits for sure, it was too much sugar added. Breakfast was ok, they have both western and asian option. I liked the fact that they had a lot of fruits. It was nice that they have a cook in case you want a fresh omelets or scrambled eggs.